The Internet of Things (IoT) is booming. As consumers, we often think of it as "things" such as Nest thermostats, SmartThings-controlled home appliances, Fitbits or Apple watches. Of course, the IoT also extends deeply into commercial environments as more devices used in places such as factories, hospitals and schools become broadly connected. Within these buildings (as within our homes), data from heating, cooling and power systems that not so long ago were at best linked to a building-level management system (or not connected at all) are now available on the cloud courtesy of the IoT. 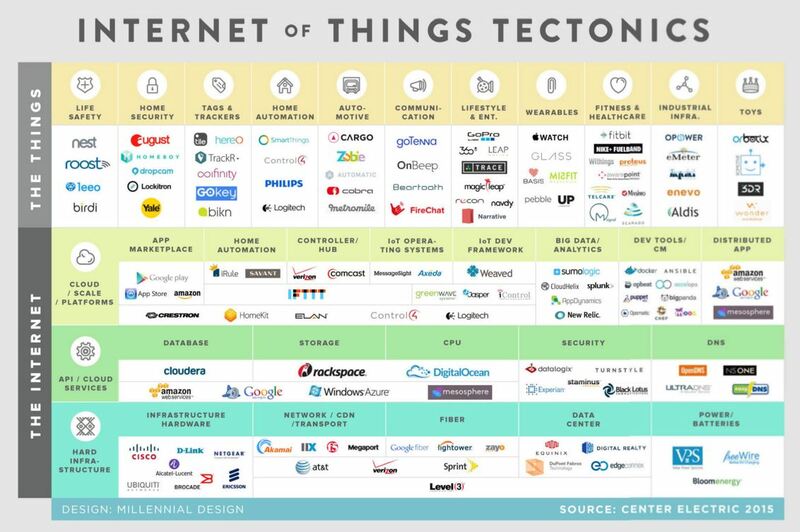 A venture capital firm in Detroit, Center Electric, compiled the graphic above (http://cen.vc/market/) that nicely shows the breadth of the IoT.